Gabriel Knight is invited to Paris by Prince James of Albany, the current Stewart heir who lives in exile in Paris, France, for a new Schattenjager case. For centuries, the Stuart bloodline has been plagued by a strange disease, a kind of anemia which, from time to time, leads them to wake up exhausted and pale, with apparent bite marks in the neck... Prince James cannot stand the thought of his infant son, Charlie, potentially becoming the next victim and asks Gabriel to keep watch for suspected "Night Visitors" as he calls them. So far they have failed to stop or even identify them, despite the use of guards and dogs, which each time unexplainably fall asleep. Gabriel and Grace decide to help but, already on the first night, the "Night Visitors" break in through the bedroom window, and kidnap little Charlie! Gabriel, who managed to stay awake, follows their car and manages to trace them on a train, but gets hit on the head and looses consciousness. When he wakes up, he finds himself in the small village of Couiza, near the ancient town of Rennes Le Chateau. After verifying that the kidnappers have left the train in the same town, Gabriel starts questioning people and exploring the area, searching for the suspects. Legend says that somewhere near Rennes-le-Chateau a treasure is hidden. A century ago, a local priest, named Berenger Sauniere, would have discovered this treasure through ancient parchments which he found in a broken pillar of his church. It turned him insanely wealthy virtually overnight. Sauniere however passed away, taking his secret with him. While some dismiss the existence of this treasure, many take it seriously, including a group of treasure hunters which have just arrived in Rennes-le-Chateau. But what if the treasure hunt is just a cover? One of them could be an accomplice of the kidnappers of Charlie. There is the arrogant John Wilkes from Australia, the extravagant Lady Howard and Estelle from the United Kingdom, the mysterious Vittorio Buchelli from Italy, the quiet Emilio Baza from the Middle East, the flirtuous French tour leader, Madeline Buthane, and... Mosely?! Of all people, how did Mosely end up in the exact same village as Gabriel at the same time?! Each of them seem to have their own agenda, but they are far from the only possible suspects. Among the local people are Abbe Arnaud, the current priest seems to know more than he's willing to tell. And what exactly is the role of English scholar, Larry Chester? Is he just here to study the history of the Templars? Grace arrives later, accompanied by two Scottish men, assistants of Prince James. As usual, Grace does the research while Gabriel does more of the investigation in the field. This time using a sophisticated computer program, S.I.D.N.E.Y. and with clues left behind by an unknown person, she unravels the secrets of the region, the history of the Templars, the Freemasons and a secret society, known as the Priory of Sion. Grace discovers that some of those groups are still around to this day, and that Prince James could be associated with it. Is Charlie's kidnapping about a ransom, could be politically motivated, or could it be related to genealogy and hide an even deeper mystery? Prince James does not want to provide details. He just wants his son back. But then the murders begin... people entirely drained with their blood nearby in a massive pool... Could actual vampires be involved? Charlie needs to be found, and fast! Gabriel Knight 3: Blood of the Sacred, Blood of the Damned, written and designed by Jane Jensen is the last game of the Gabriel Knight series, as well as the last adventure game published by Sierra. As usual, Jane masterfully mixed historical facts with myths, legends and a fictional story involving the occult. Based on the bestselling 1982 book, "The Holy Blood and the Holy Grail", she uses the actual mystery surrounding Berenger Sauniere in the small French village of Rennes Le Chateau, along with the rich history of its surroundings, and blends in her fictional story on vampires. 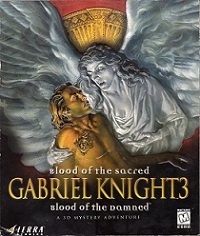 Each installment in the Gabriel Knight series has had a significant change in graphic design, with the first game, Sins of the Fathers, featuring computer-generated, partially rotoscoped graphics and scanned comic book art, and the second, The Beast Within, being entirely in FMV. Gabriel Knight 3 is the first game in the series to be in full 3D. With the introduction of a brand new game engine (the only game for which this engine would turn out be used) the release of the game went through a number of delays. Certain parts Jane had planned, were replaced with alternate simpler parts to reduce the delays and have the game released. This laid to infamous cat-mustache puzzle which some refer to as the worst puzzle ever. Luckily the game also contained what many consider the best puzzle ever made: Le Serpent Rouge. The game's score was composed by David Henry, based on themes created by the series' original composer, Robert Holmes.